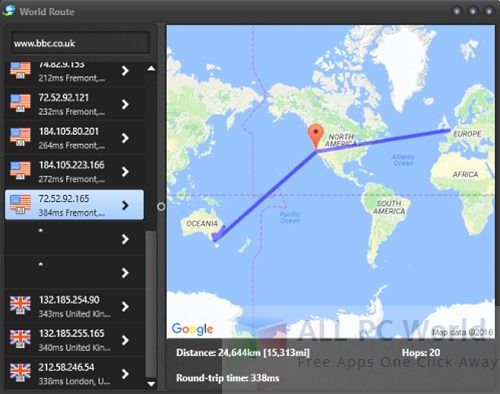 World Route is a free route tracing tool which displays the complete route of your packets on the world map. This free download is an installation setup of WorldRoute for Windows x86 and x64. If you want to know the exact location of the servers from where your packets pass when reaching the destination then World Route is the best tool. It is a visual trace route which displays the path of network packets i.e. the hops to any website or IP address on the visual map. After you enter the IP address or the destination web site and press Enter, the program starts displaying the IP address and physical geographical location of the hop with a broader outline on the world map. It also displays the complete distance to the destination and the round trip time. A friendly interface is there so that anyone can use the tool, you can get the complete route with one click. Moreover, it is a lightweight tool which consumes little or no CPU power. Zooming feature does not displays any advanced information for security purposes but you can see the complete route followed by your packets. 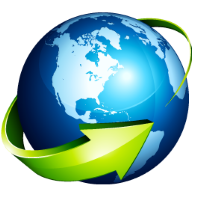 Click the below link to download the installation setup of World Route for Windows x86 and x64 architecture. It is comaptible with all the latest versions of Windows.